Sew Damned Creative: CLOSED: 100 Facebook Fans Giveaway! CLOSED: 100 Facebook Fans Giveaway! If you follow my Facebook page you'll know that I said from the very beginning that once I reached the 100 likes milestone that I would host a vintage pattern giveaway. In the wee hours of this morning my page reached, and surpassed, the 100 likes mark! I'm so excited! To celebrate that I want to offer two readers a vintage dress pattern in thanks for their interest and support. 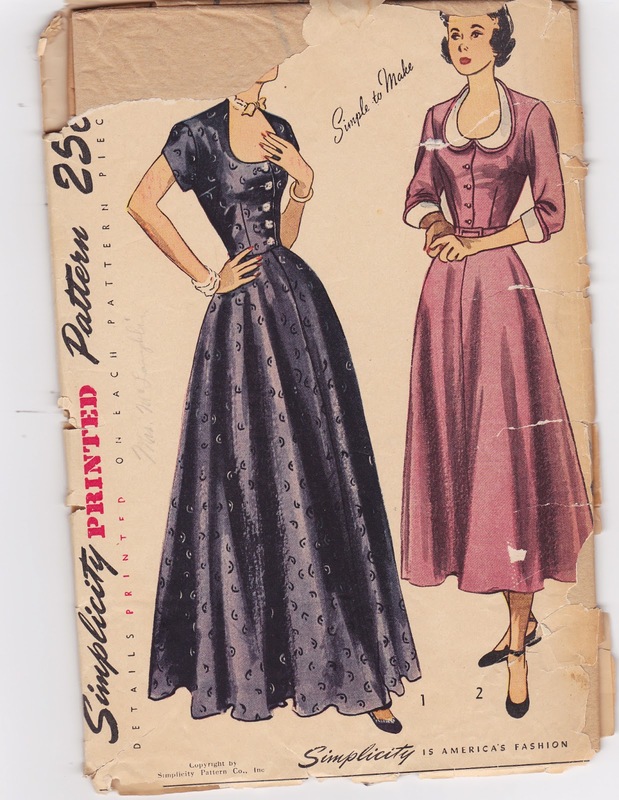 The first pattern is a 1940's Simplicity pattern, numbered 2741, for a scooped neck shirtwaist dress in either evening/ankle length or tea length with short or 3/4 sleeves and detachable cuffs/collar. It is size 14, bust 32 inches, and is partially cut (very neatly). The envelope is in sad shape, but the pattern is in great condition. No instructions are included (sorry, they are just missing and were when I purchased the pattern) but it is a simple dress to put together from what I can tell. 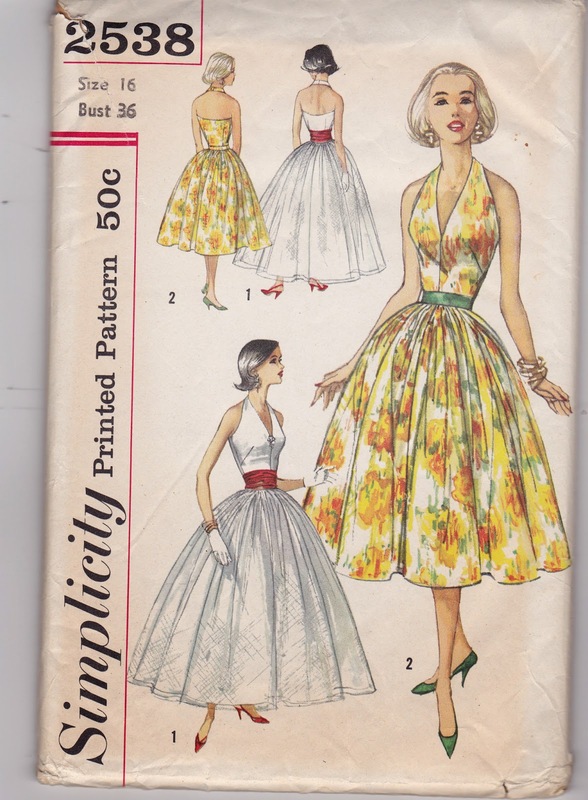 The second pattern in this giveaway is another Simplicity pattern, but this one is from 1958, numbered 2538. It is the perfect Marilyn Monroe halter style dress! It is a size 16, bust is 36 inches, and has skirt length variations and an optional cummerbund. The pattern is partially cut and in great shape. The envelope has some tears but is still intact. Must like Sew Damn Creative on Facebook and leave a comment on this post letting me know you have done so. For an extra entry, tweet this post and comment with a link to your tweet. For an extra entry, pin this post on Pinterest and comment with a link to your pin. You can combine your links and like comments into one, but I must have the links for extra entries to give you credit. Giveaway will be closed on Friday, June 7, 2013 at Midnight EST. Winners will be announced by no later than Sunday, June 9, 2013. Announcement will be done via blog post and on the Facebook page. Oooo, I love both, but would really love to have the 2nd pattern! It will be a random draw for both patterns. Good luck! Aww... love you too, babe! Good luck! Gotcha! You have all 3 possible entries, Kimberly! Thank you! I have you for 2 entries. If you have twitter you can tweet this post for a 3rd entry. Good luck! Love these patterns!! Would love to win one of them!!! Have you liked the facebook page? If so, I'll need to know who you are. ooh wow would loved to win this nice offer!! You have 1 entry for liking the Facebook page. 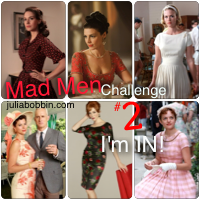 If you use Pinterest and/or Twitter you can get up to two more entries. Good luck! Isn't it amazing?! You've got 1 entry. Good luck! Thanks Allison! I have you in for 1 entry. Good luck! Nice giveaway! I like pattern #2. Found you on FB and liked. Thanks Angela! You're in for 3 entries. Good luck! Just found you via a shout out from Sew Retro Rose. That dress is so gorgeous, I hope it goes viral. And that I win the pattern, because that would be particularly awesome. Thanks Pamela! I have you in for 3 entries. It is a random draw for both patterns based on all entries. Good luck! Thank you, Rochelle! You have 1 entry into the giveaway. Good luck! This is my first time to your blog, It's lovely and I will be sore to pop in again. I like you on facebook,Thanks for your genorosity. Thank you Jacqueline! You have one entry in the giveaway. Good luck! 100 Facebook Fans Giveaway Winners!